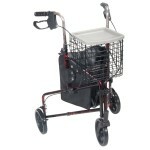 Why Get A Rollator Transport Chair? What Are The Benefits? 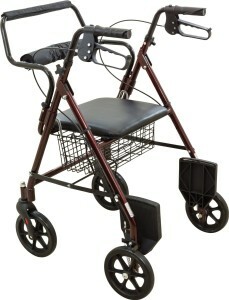 The flexibility and freedom a rollator transport chair can offer over a traditional rollator is well worth the additional cost. A rollator transport chair can very easily and quickly be converted into a convenient and lightweight wheelchair or rollator. The benefits of this ability is especially helpful when you are traveling, needing to go shopping, or have had an operation such as a hip operation or knee replacement. 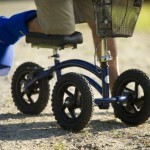 The traditional wheelchair is heavy and cumbersome, making it extremely difficult to get in and out of vehicles. A rollator transport chair is much lighter and can easily be lifted into the trunk of the car and making them easier to take with you on trips where if you go. 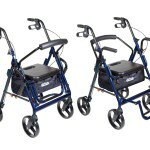 Click here to see the best rollator transport chairs. They make a wonderful, two in one transport chair if you are transitioning from an injury or operation such as a hip replacement or knee surgery. 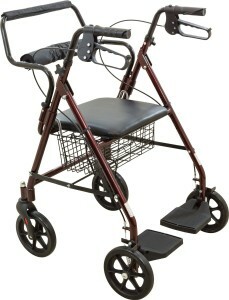 You can start with it as a transport chair, and as you regain your strength, you can work up to it as a supportive rollator walker to help you build up balance and muscle strength. Weight is an essential consideration for a transport chair choice. 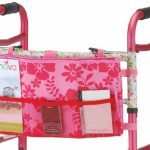 They are lightweight and offer flexibility for travel, often folding into a smaller unit than your traditional wheelchairs or rollators and are considerably lighter in weight. A rollator transport chair is perfect for using as a wheelchair in a busy shopping center or airport or used as a stable, supportive walking aid as you stroll around the country town on a day trip out. 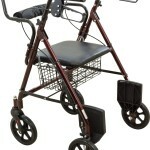 Rollator transport chairs have smaller wheels than a wheelchair. Make sure when choosing your transport chair, the wheels are preferably around 8 inches as this will give you a smoother ride. 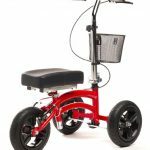 Small wheels are not good on rough terrain and can give a bumpy, uncomfortable ride, plus making heavy work for the person wheeling transport chair. The design and width of the seat is important. Be sure to look at the shape and design of the seat, is it padded, will it be large enough and what is made from… ? It is important to choose a rollator transport chair with a padded seat if you are going to be spending long periods of time sitting in it. When you need a carer to push you around during the times when you don’t feel stronger enough, are elderly or are recovering from operation, using a rollator transport chair which can double as rollator at a later date is invaluable. 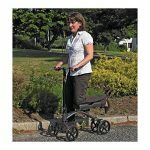 They are a much better option than a traditional wheelchair, offering the flexibly of being light, easy to transport in and out of cars when needed and can also provide confidence and support when walking.